Beautifully decorated windows at a Christmas Market at the Medieval Castle Ronneburg in Hesse, Germany. Angels, stars and hearts feature prominently in these decorated windows during the annual medieval Christmas market at Ronneburg Castle, Hesse, Germany. A series of four arched windows, part of the ancient Ronneburg Castle, are a great addition to the decorated castle for the Christmas markets. 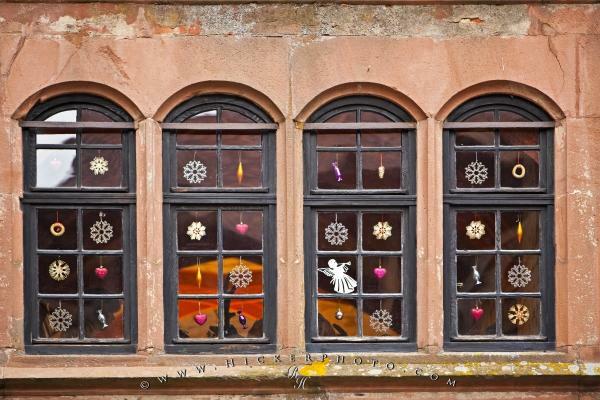 Photo of the decorated windows of the Ronneburg Castle during the annual Christmas Market. Pictures from photo gallery "Ronneburg Castle"
This picture is part of the photo album "Ronneburg Castle" - there are more beautiful images waiting for you.